Super fast delivery to Hungary. :) Thank you! Perfect product, same as in the ad, great seller, very fast shipment. Thank you. Fast shipping. Well packed. Great product. A+ Thank You! Don’t trust this seller. Worst service. I have been using this product definitely every night for almost a month and when I pair this product with the Centella Blemish cream, my acne stays away. My acne-prone areas of my skin have been clear. I know this is not an "end-all" to my acne/scars, but this product sure does help. 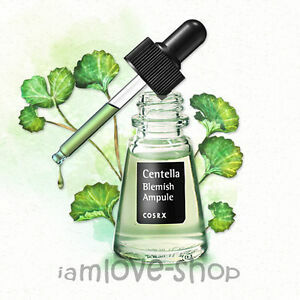 Centella is a GAME CHANGER! Previously I used Clinique's acne and fine line serum for my blemishes. Ever since I discovered this serum it has been the best of the best. Clinique's serum did not work for my skin for 2 weeks and the same 2 pimples I had on my cheek finally disappeared after using the Centella serum for 1 day! I use it twice a day, AM & PM. I have normal combo skin, late 20s blemishes. Trying to achieve that natural glossier skin. I am new to using cosrx products but recently I've been trying these & I'm in love. They don't break me out during the first use, a little goes a long way, & no harsh smells or chemicals. Since the product was estimated to come around April and it came quicker was a very big surprise to me. It wasn’t a long wait at all to get This. Can’t wait to try it out x ☺️ The packaging was good and wrapped inside so it wouldn’t spill or get damaged on the way.